Hybrid foods are all the rage these days, but Australian Mark Murray was way ahead of the trend. 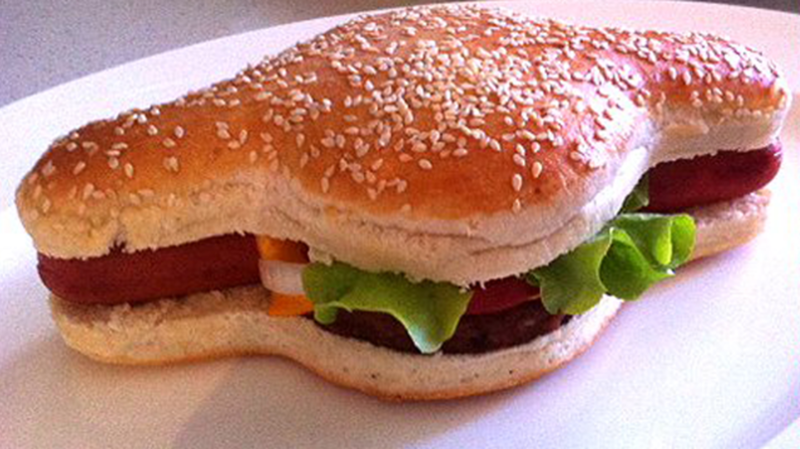 Back in 2004, he came up with the idea of the Hamdog—a hamburger with a hot dog nested inside of it, all encased in a one-of-a-kind bun—and 12 years later, it’s finally available for purchase. "I had the idea on holiday when I was leaving a bar in Nashville. I grabbed a burger and a hot dog as I was really hungry. I was sitting in the car eating them both at the same time and my wife was looking at me like I was an idiot," Murray told CNBC. Australians can now find the Hamdog at sporting events and markets, and according to CNBC, Murray is looking to bring it to the U.S. in 2017. The culinary creation comes with lettuce, tomato, pickles, cheese, ketchup, mustard, and mayonnaise, and costs about $6 U.S. The Hamdog empire is still in its infancy, and Murray told news.com.au that a company is currently developing a way to semi-automate the bun-making process; as of now, all the bread is baked by hand. He’s also looking for "resellers" (much like a franchisee), so if you’ve got $10,000 and a passion for newfangled meat delivery systems, your future is calling.